Designing your own dream home from scratch and watching as your vision materialises is something everyone has thought about in their lifetime. We’ve all been there, exasperated while watching another family on Grand Designs skimp out on cheaper material and opted for those awful textured ceilings. Building your own dream home from scratch takes huge amounts of time, dedication and money – instead of going for an entire house, sometimes it is easier to design one room in your house. According to Household Quotes, a UK household spends an average of £7,000 on a kitchen – whether you’re thinking about renovating an existing kitchen or you’re looking for a brand new kitchen extension, you could design your own dream kitchen. From the finer details such as fittings and cupboard door handles to the overall style you want to go for, who’s better to design your own personal space than you? Here are a few things to consider when designing your own kitchen. There comes a time when you realise your kitchen needs a little more than just a fresh lick of paint, and unfortunately it doesn’t come cheap. From installing the kitchen carcasses to getting certified plumbers and electricians in to do a safe job, there’s a lot to consider. So first things first – don’t ever cut corners. Sit down and work out your budget accordingly. Leave a margin just incase something goes wrong and be prepared! Research before you buy – you will want certified professionals when it comes to looking at gas, water and electric mains. Social media is a great place to find customer reviews. You should also be able to ask for a professional’s portfolio and other customer reviews! Look at recycling your old kitchen. If you’re replacing an old kitchen with a new one, there will be some items you can recycle and reuse. Whether it is plates, cutlery, door hinges or lighting, you might save yourself some extra cash. Shop around for a professional kitchen fitter – a qualified professional will cost more than the local handy man, but the end result will be much better. Rip out old kitchen carcasses from the wall – you could do some serious damage to the walls and pipes – we guarantee this which will cost you much more in the long run. Cut corners in order to save some cash – it’s dangerous and you will be paying for it in the long run. Hire your local handyman to fit your kitchen. Professional kitchen fitters and designers have years worth of experience and understand the complex nature of fitting a kitchen. If you go with a handyman you’ll end up with a badly fitted kitchen and a hole in your pocket. While this seems like a fairly obvious point, it is crucial that you’re realistic about the design of your dream kitchen when it becomes a reality. If you regularly host dinner parties and entertain, then a kitchen with a huge island that takes up a lot of floor space isn’t viable. If you love to bake then you need a kitchen with worktop space to fit all the necessary appliances. Remember, what works in one person’s kitchen will not necessarily work for others. Designing your kitchen should have an element of practicality involved. Think about exactly what you use your kitchen for – you know your own space the best, so make sure it is suitable for your lifestyle. Consider looking at energy efficient appliances, for example, energy efficient boiling and ice water taps. You’ll be saving cash and the environment at the same time. Consider the benefits of downdraught extractors and extractors hoods before you make a decision. Explore the wide range of materials available to use in your kitchen. From tiles to the flooring and worktop, it needs to be durable and meet your needs. Put the aesthetics of the kitchen before the function of the room. Choose materials purely because they’re cheap. Research is key! If you’re designing a kitchen based on an old one, then the process of designing should always be based on the existing space. A great way to find out what will and won’t work is by drawing a to-scale plan of your existing kitchen and then make the changes you want using tracing paper. This means that you can overlay your layout options and easily see what will sit where and whether anything will be blocked. Try and find a space for a separate utility area. Consider how easy it is to access the garden – summer evenings are made for dinner outside. Pay a professional kitchen designer for their input – it will be much cheaper than getting further down the line and realising you have a badly designed kitchen. Have a toilet opening directly into your kitchen or dining room. Stick to one layout – try a few different layouts to see what works. Whether you’ve got an open plan home or a home with many walls and doors, you should consider just how you want your kitchen to link with other rooms. Every room should seamlessly lead into the other, working in harmony. Look at how natural lighting will reach the kitchen. Think about whether you want a dining room in the kitchen. Ask yourself if you need extra space for a larder. Natural lighting offers huge benefits to every room in the house. From helping keep mold at bay to reducing your electricity bills, you want to make sure that your kitchen is getting as much natural lighting as possible. Whether this is from large windows or roof lighting, there are many options to choose from. That being said, you’ll also need artificial lighting – this could be from ceilings or you could have under cabinet lighting. Prioritise the best quality space. If you spend more time in the kitchen then you’ll want it to be the room with the best daylight and views. Leave lighting as an afterthought – it will completely change the look of the carefully planned colour scheme and materials you’ve chosen. You need to make sure your kitchen will fit your kettle, microwave etc, and look good in the process. What works for your friend may not work for someone else. For example, some people like their kitchen having a ‘less is more’ aesthetic with no equipment on kitchen surfaces. Others enjoy having a kitchen that looks full and busy. Think about what you use everyday, and the logistics of where they should live – if you drag yourself to the cafetiere every morning to rid yourself of your zombie like state, then putting it in the top shelf of the kitchen cupboard isn’t viable. 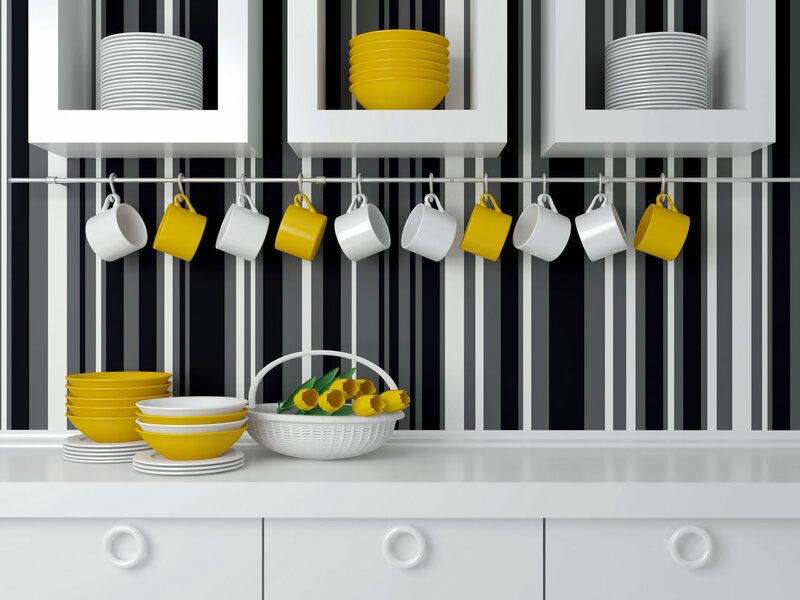 Look at the ways you can store appliances in your new kitchen. Think about the functionalities of where you want to put your appliances. Tuck your appliances away – you won’t be able to easily get to them! If you’d like some advice regarding your kitchen then do not hesitate to get in touch.